Sharjah Roads and Transport Authority (Sharjah RTA) has announced that it will replace 767 of its taxi cabs over the next six months, at a cost of AED 42.75 million (US$ 11.6 million). Sharjah Taxi’s fleet has grown from 720 cabs in 2012 to 1,540 this year, transporting an estimated 16.2 million people per annum and accounting for nearly 30 percent of the emirate’s taxis. Sharjah, which is home to more than 800,000 people and welcomes 2 million tourists each year, supports four taxi franchises: Union Taxi, City Taxi, Emirates Taxi and Sharjah RTA’s own Sharjah Taxi. The 5,300 cabs of the four services carry about 45,000 passengers a day. Sharjah RTA’s taxi fleet services Sharjah city and the east coast cities of Kalba, Khor Fakkan and Diba Al Hisn, plus Al Dhaid in the interior of the emirate. 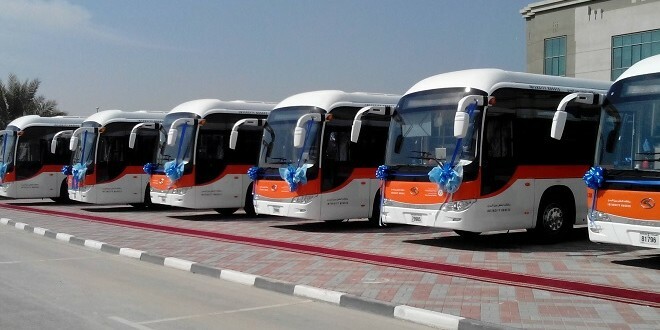 Meanwhile, the authority has also increased it’s bus fleet to 69 vehicles, purchasing 39 new buses so far this year, at a cost of about AED 30 million (US$ 8 million). Sharjah RTA bus and taxi fleets transport some 28 million passengers annually. New buses have been added to improve Sharjah RTA’s Intercity bus routes. The authority began introducing free Wifi services to Intercity bus routes last year as part of its plan to create more intelligent bus services. Intercity services connect Sharjah city with Dubai, Abu Dhabi, Ajman, Umm Al Quwain, Ras Al Khaimah and Fujairah. The RTA estimates that 4.5 million passengers rode on its Intercity bus services during the past six months. Sharjah RTA is also undertaking feasibility studies for a railway or a tram network as part of strategic transport plans to provide for the emirate’s transport needs.